Enjoy a world of fun and excitement for the whole family at one of Asia's best theme park and SAVE NOW with the Universal Studios Singapore discount ticket. Explore the 7 movie themed zones based on your favorite films, see world class shows and get on the most exciting rides of your life with a promotional priced tickets. 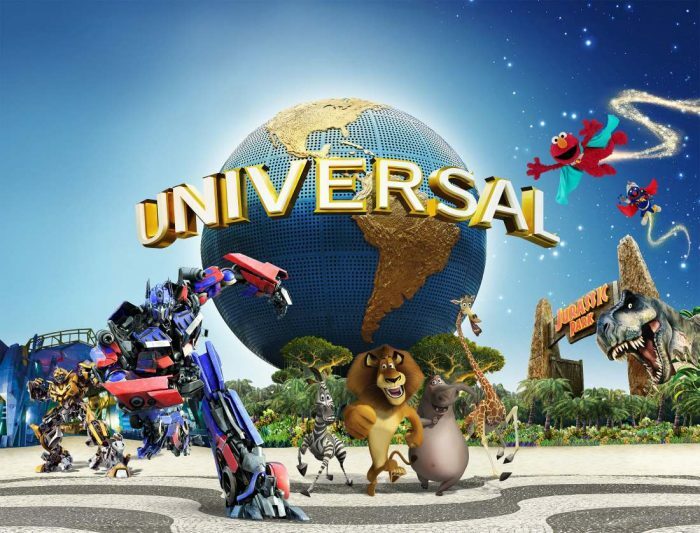 Meet and greet your favourite Universal Studio's cartoon and movie characters -- from Shrek and Puss right to Elmo and friends with your entrance pass. Feel the thrill of a twin rollercoaster of Battlestar Galactica and pick your side - the Human or Cyclops. Get on the park's most popular ride or main attraction - the Transformers and enjoy a 3D ride like no other. Wait for the USS Parade - featuring wonderful character coming alive, making your little one gasp in amazement. Explore the future with a 3-D battle in Sci-Fi City. Snap photos, dine, stroll or watch live shows in the USS park's 24 attractions. And enjoy this must see Singapore attraction at a discount. Want your trip to USS to be more special? Why not be the day's superstar with the USS Singapore VIP Experience ticket pass instead? Have a question about USS? Check the FAQ below. What are the top rides in the USS Singapore? There are 28 rides in the USS Singapore. But here are some of the top ones. These are 2 separate rollercoasters but with several near collisions mere inches apart. The Human is a seated roller coaster and the world’s tallest with speed up to 90 km/h. This is the parks most intense ride. The Cylon is a loop and inversion roller coaster that includes a zero-g roll. This is the park's favourite ride. It's a 3D ride with 3D glasses and is said to be one of Universal's most sophisticated and satisfying ride. This ride takes you on a mix of roller coaster, haunted house, and multimedia adventure as you try to escape the clutch of the mummies. This is a wet ride with river rafting experience. Expect to get soaked as you'll finish the ride with a pretty large drop. The Enchanted Airways is a junior roller coaster taking you on a journey of fairy tales, from the Three Little Pigs to the Big Bad Wolf. This family-friendly ride lets you travel above most of the Lost World themed area. Your kids will hop on a jeep, and venture into an abandoned excavation site in ancient Egypt. This ride has one of the longest queues, with an average 45 minutes of waiting time. Can I buy the tickets on the same day at the counter? Yes. But since the queue can be extremely long, the best way to get the USS Singapore ticket is by buying it online since you can skip the queue and enjoy some discounts. Can I exit USS Singapore and re-enter on the same day with the same ticket? Yes. But make sure you keep your ticket and get a re-entry stamp at the exit. Can I transfer the tickets in case I can't make it to the USS ? Do I need to pay extra for the rides inside USS? No. All attractions are included in the ticket price, except for special events like Halloween Horror Nights. What's this add-on called the Express Passes ? The Express Pass is an add-on on top of your normal tickets. You can use the Express Pass to enjoy a shorter waiting time since you get privileged access to the express lane. Express Pass is crucial during the weekend and holidays. What type of Express Passes available in USS Spore? There are 2 types of express passes - the normal Express pass and Unlimited Express Pass. The normal Express pass lets you get express lane access ONCE per attraction, while the UNLIMITED one lets you do it as many times as you wish. Where can I buy an Express Pass? Online, you can only buy the Express Pass at the Sentosa own website. Alternatively, you can also buy it at the theme park (which is a good idea, since you can check how busy the queue is before buying). These express passes are sold at the ticketing booth and in selected retail and F&B outlets within the park. How much does an Express Pass cost? It depends on the day of your visit, as the price changes daily. But as a reference, the Normal Express Pass starts from SGD 30 (and goes up to SGD 90 ) while the Unlimited Express Pass starts at SGD 50 (and goes up to SGD 120). If the weather is bad, can I get a refund? No. The USS Singapore is open during rain/ unpleasant weather. And even if the outdoor attractions are closed temporarily during thunderstorms, USS Singapore do not offer any refunds. Do I need to buy a ticket for my baby/ infant? No. Kids under 4 enters the USS Singapore for free. But please bring some form of photo ID for verification. What's the best days to visit the USS if I want to avoid the crowds? Visit on the weekdays. Avoid the weekends, public holidays and school holidays (March, June, September, November and December). Be there early in the morning, or late in the afternoon. Lack of crowd during both time will let you enjoy more rides as the queues are shorter. Light clothing, sunscreen and comfortable shoes. You'll be doing a lot of walking under the hot tropical sun. From September to February, a poncho may be a good idea as drizzles and heavy rain in the evening is common. Can I bring outside food into the USS? No, except for baby food/ special food for medical needs. Can I bring a water bottle here? Yes. Bring your own water bottle and save since you can refill your water bottle around the park's water fountains . Yes. You can bring your own inside, or rent a stroller here, but the rental cost is prohibitive (around USD 11). Is there a nursing room here? Yes. But take note that it is only at the entrance. Is the USS Singapore disabled friendly? Yes. Please stop by the Guest Service area and get your Rider's Guide for more specific information for the disabled in the USS Spore. Is there a halal restaurant in USS Singapore? Yes. The Mel’s Drive In, Friar’s, Goldilocks, Oasis Spice Café and Marty’s Casa Del Wild Food Court are all Halal-certified. You can also exit the park and find halal outlets at the Malaysian Food Street or The Forum. Are there water in the toilets ? Like other toilets in Singapore, most toilets here are dry toilets. So, it is better to bring along your own clean water in a bottle. Is there a prayer room here? Yes. There's a tiny prayer room between the Battlestar Galactica’s lockers and ancient Egypt. Do they have Friday prayer here? Is the SEA Aquarium inside the USS Singapore? Is there a locker/ luggage storage area here? Yes. Locker areas are stationed around the park. For bigger items (like your luggage) there are bigger lockers near the entrance. Oversized luggage can also be stored at the Rental Services counter. What are other attractions near the USS ? Since you are in th Sentosa island, you can find these nearby attractions to the USS.